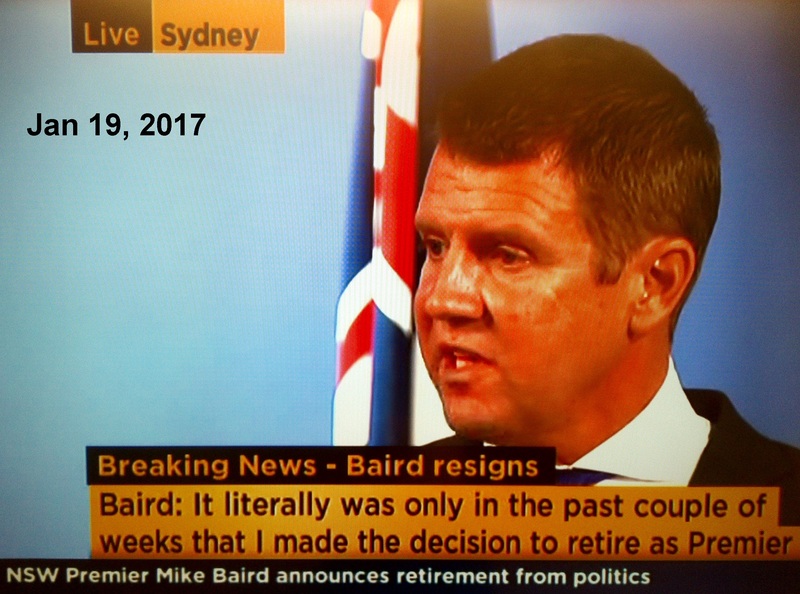 In January of this year (2017), you ask to meet Mike Baird. You want to discuss why his father Bruce cancelled your mooring all those years ago. You have a number of letters to show (left). You hope Maritime Minister Duncan Gay will attend. Both gentlemen retire from politics shortly after. You get a call from Mr Voyer on 17/1/17 as a result of your contacting the Ministers. He will investigate. He sends you an email that same day. 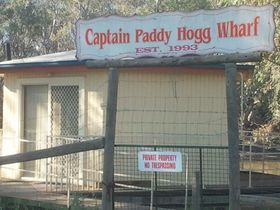 He called it "Maurice Furlan - Murray River Botel Issue Circa 1985-88". You believe he has seen a file about the matter. But Maritime and many others have long said that they no longer hold any information. You travel to Port Kembla to meet with him personally about this. You know those dates are not correct. He denies seeing a botel file but admits that there are Official Registers which record vessel confiscations and mooring cancellations. You prepare these documents in readiness to send to Maritime. You want their responses to a number of questions. Document 1 is a copy of a letter from Baird to Murray. 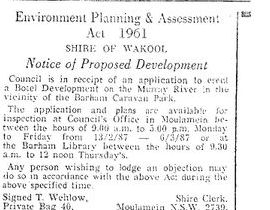 It states (para 3) that "Wakool Shire Council determined the development to be 'designated' and required ........to allow development." Confirm that this is an authentic document. Document 2 contradicts Document 1. According to Adams the Development was not "Designated". Maritime knew it was not designated because they were consulting authorities under the Draft Murray Regional Environmental Plan. Confirm that below is the cover of a Draft Plan in which Maritime is listed and which defines 'designated' development. Confirm that the date on which the Plan which "designated" the botel came into effect long after the formal application below. 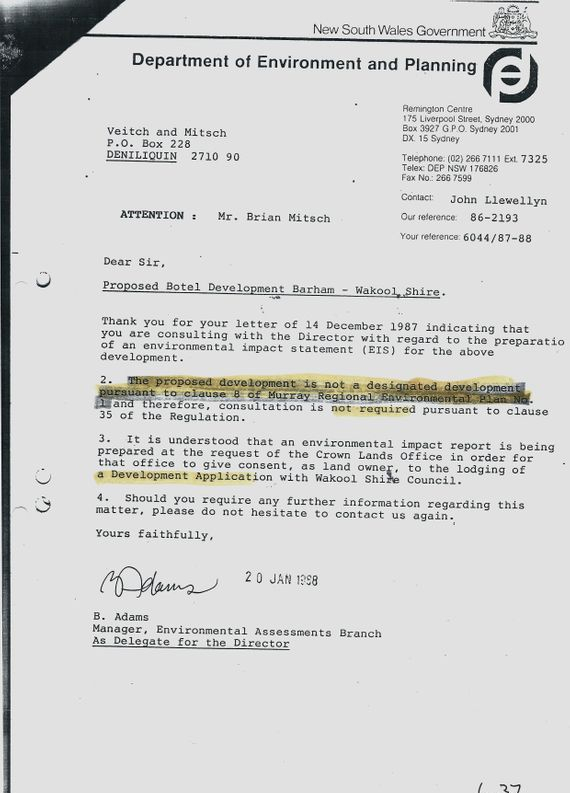 Confirm that the proposed Botel was not "designated" development at the time of the formal application (above). 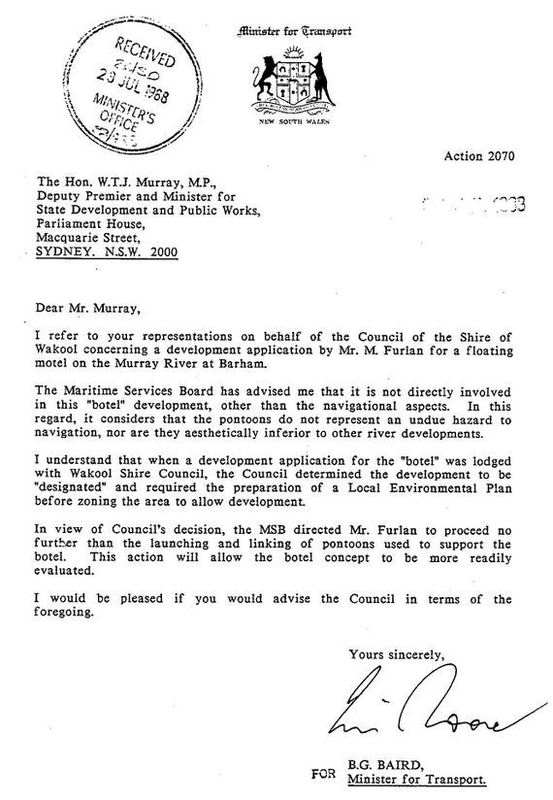 Confirm that Maritime was both "consulting" and "consenting" authority under the proposed plan and the "consenting" authority for commercial marine development. 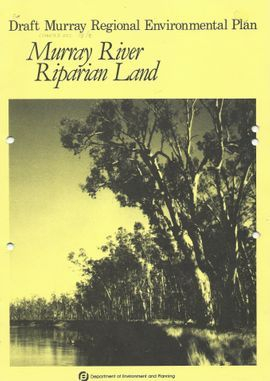 Here is a picture of three maritime developments on the Murray river at Barham NSW. Confirm that NSW Maritime gave consent to vessels either side of the vessels pictured in the centre. There is an original document 3; of which a certified copy is shown. 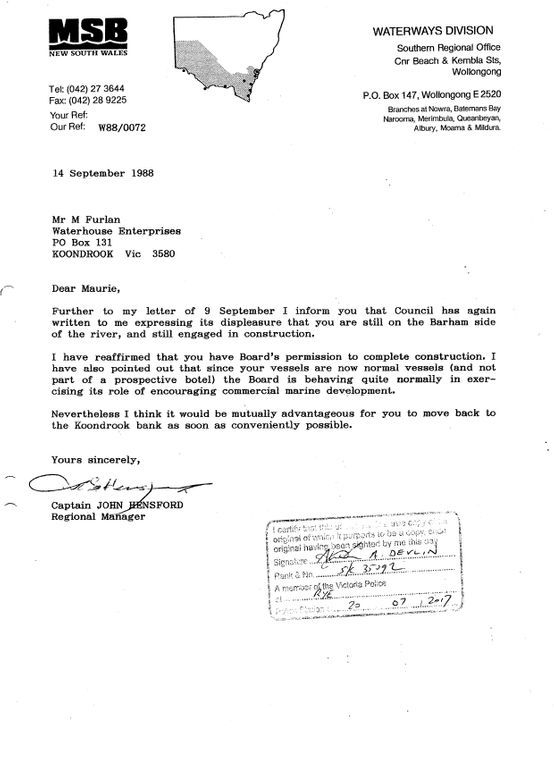 In it the Maritime Regional Manager, Captain John Hensford "consented" to the Waterhouse Enterprises commercial marine development. Advise if Document 3 is an authentic document. Confirm that the Regional Manager had the authority to consent to the construction of the vessels. Shown left is a record from the NSW HANSARD of 10 November 1988 by the Assistant Minister for Transport (Maritime). He denigrated the project. He stated that there "may be a need to stop the construction and move the floating motel downstream". He "assures that every effort will be made to overcome the problem". Confirm that the construction was stopped by council and confiscated by maritime officials and delivered downstream. There is an original document 4; of which a certified copy is shown. It shows the same signature as document 1. 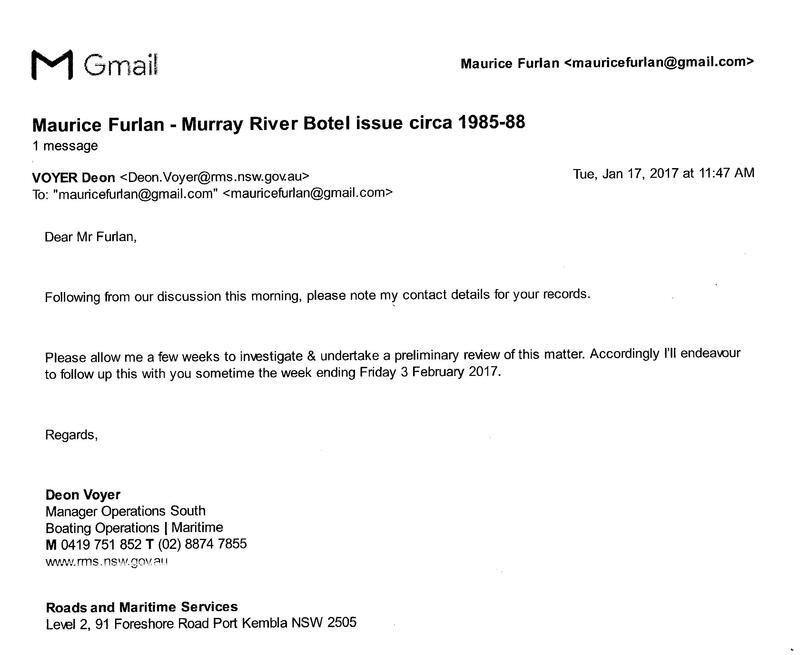 The Notice required the removal of 2 botel units from the Murray River. It informed him that his occupational licence had been cancelled. Advise if the Notice is an authentic document. 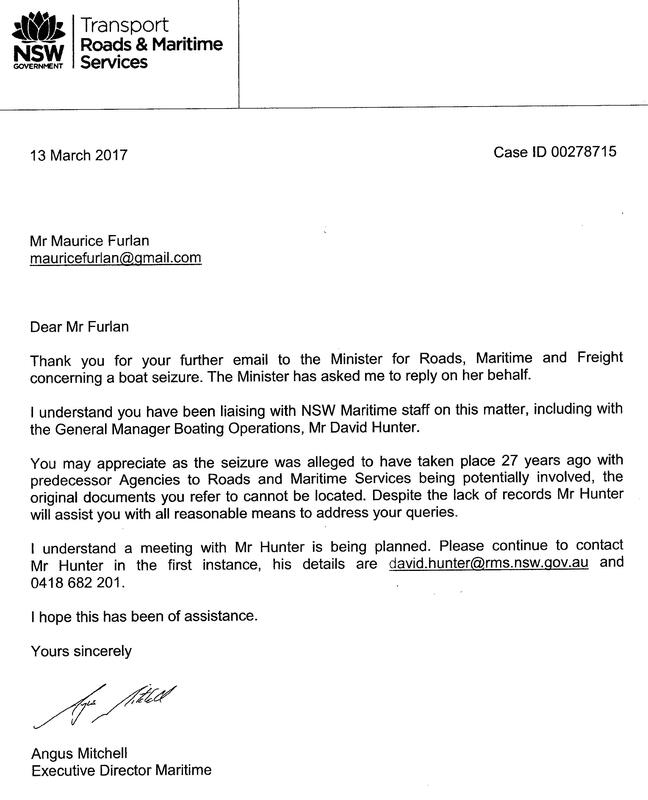 Advise if it was Minister Baird who cancelled the "tenancy at will" (mooring licence). The notice was issued pursuant to sec 13(U)2 of an Act which has since been repealed. That part of the act allowed only for the issuing of a fine of 4 penalty units. Advise if the fine was issued. The notice drew attention to the possibility of legal action which on conviction could impose a fine of $400. Advise if, when and where this court hearing may have taken place. There is an original document 4; of which a certified copy is shown. The Regional Operations Officer issued it pursuant to sec 13U(3). He claimed the vessels were "illegal" and assumed possession of them. The previous Manager did not say they were "illegal" in document 3. Confirm that Maritime took possession of the vessels. 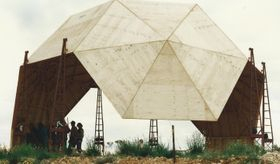 Here is a picture of the dome superstructure before placement atop 34 pontoons (below). Here is a picture of the confiscated vessels. Here is a current google map of the River Murray Reserve at Koondrook VIC. The (Non-pv) indicates an area which is not managed by Parks Victoria. 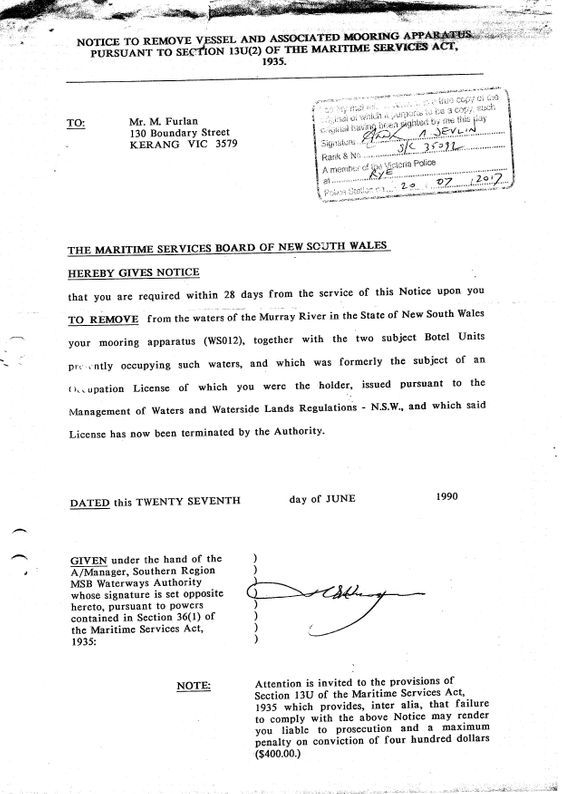 According to them NSW Maritime manages a part of the reserve however there is no maritime activity there. Licence number WS 012 in the name of Mr Furlan was located in the Non-pv area. Advise if moorings WS 001 to WS 011 are located at the Non-pv area. 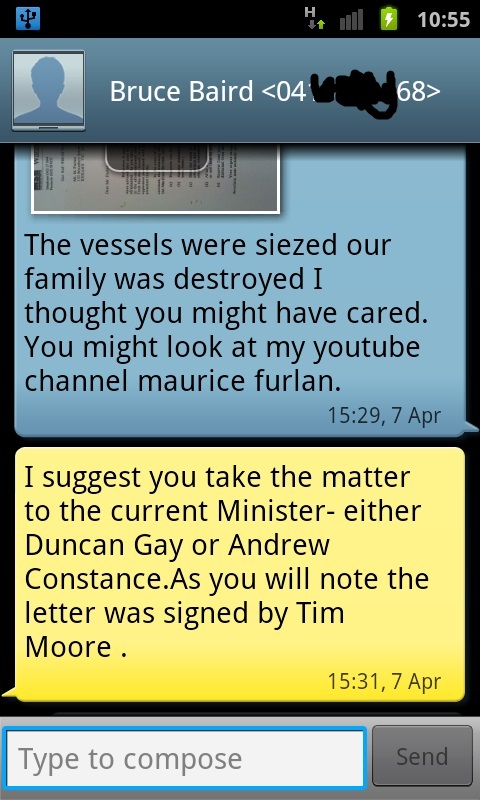 Confirm that due process required the responsible Minister to cancel Mr. Furlan's licence. 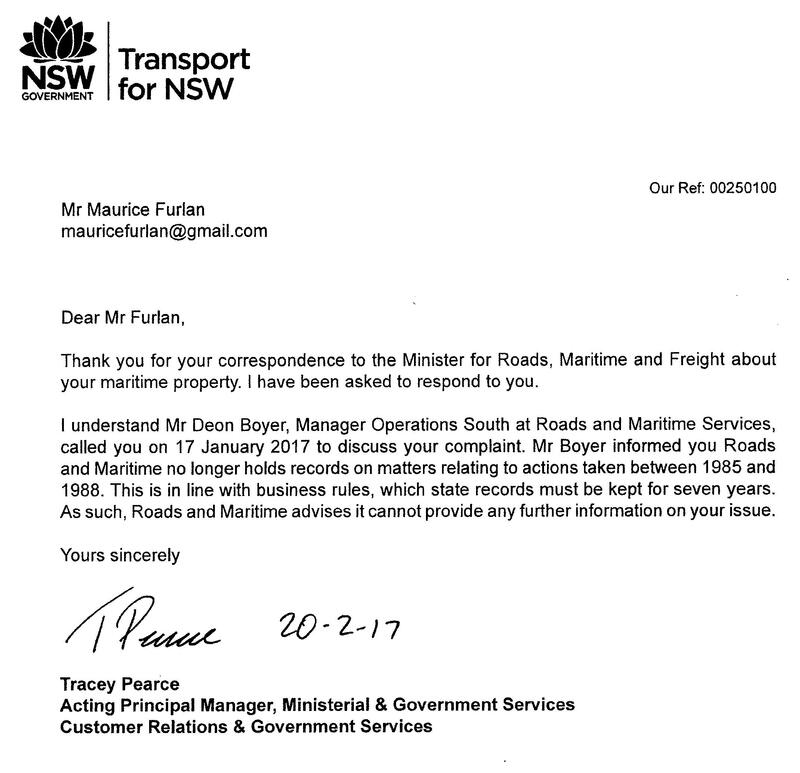 Please provide a cancellation document having the minister's signature otherwise confirm that mooring WS012 was not cancelled as described in Notice. Here is a picture of one of the vessels presently located downstream near the Murray Downs Marina NSW. There is no trace of the other. 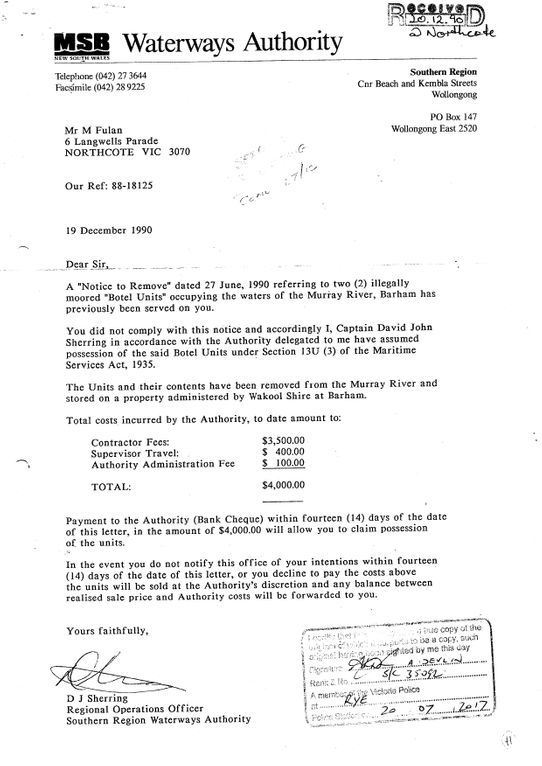 Justify why NSW Maritime confiscated the vessels and destroyed a family business known as Waterhouse Enterprises. Indicate that you intend to return the vessel and re-instate the mooring at Koondrook. Indicate an appropriate offer of compensation.